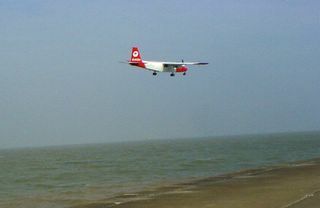 I narrowly avoided had my hair parted by the Coastguard patrol this morning as the Islander aircraft swept past the promenade at Westgate towards Margate. I was on my daily run and caught a hurried and very lucky snap with my camera phone. It's almost exactly twelve months sinceI the privilege of flying it along the same route. but I don't think they knew it was me puffing along the prom!